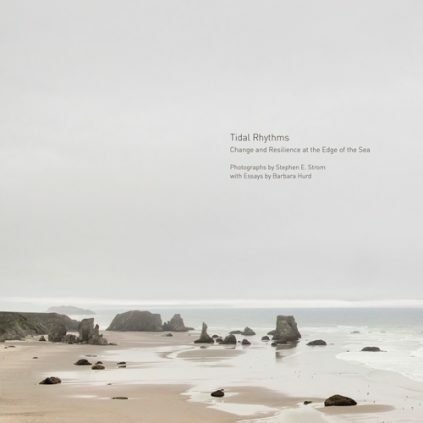 Tidal Rhythms: Change and Resilience at the Edge of the Sea is a collaborative effort by photographer Stephen Strom and award-winning essayist Barbara Hurd. Strom’s images, taken along beaches in the Gulf of California and the Northern California and Oregon coasts, document a world teeming with ancient life-forms, clinging to rocks and finding nourishment but revealed for only a few hours before the tidal waters return. The primitive flora and fauna together create transient marine landscapes whose complex patterns resonate with what we humans perceive as beauty. Following the rhythms of Strom’s images as they travel between intimate portraits and expansive vistas, Hurd’s lyrical and philosophical essays both continue and complicate those cadences as she explores not just resonance, but also disturbance. As artist and writer move us from high tide to low tide and from the panoramic to the minuscule and back again, the reader is confronted with the larger issues of what happens as the seas rises, warms, and acidifies. Tidal zones are one of the first landscapes to be threatened—almost invisibly—by global climate change. Mussels, barnacles, and tidal pools are flung and ruffled or warmed and acidified in ways that stress the lives of those who live there. Shells begin to thin, species migrate north, and habitats literally disappear, yet few people are even aware of these amazing environments. Change, of course, is part of an ancient pattern. For billions of years, the sea has risen and fallen, and life-forms have managed to adapt or not. But the current pace of change confronts us with a new and urgent question: Can the long-established but delicately balanced worlds between tidelines evolve rapidly enough to enable continued sustenance and maybe even a new beauty? In Tidal Rhythms, we are given the gift of a new world-view. –Lauret Savoy, Professor of Environmental Studies, Mount Holyoke College and author of Trace: Memory, History, Race, and the American Landscape (Counterpoint Press, November 2015).